A George Soros-funded NGO which is trying to push gay marriage on Cambodia “must close”, said Prime Minister Hun Sen, accusing the group of serving foreign interests. The CCHR was founded in 2002 by former opposition leader Kem Sokha, who is currently awaiting trial on treason charges, accused of conspiracy to foment a colour revolution, after it emerged he told supporters he had received advice from U.S. experts. A report published by the organisation last Thursday, entitled ‘Cambodia’s Rainbow Families’, demanded the nation grant gay couples the right to marry and adopt children. Based on interviews with 121 individuals in LGBTIQ (lesbian, gay, bisexual, transgender, intersex, ‘queer’) relationships, the report also urged the introduction of a “gender identity law” which would allow people to change their birth gender on official documents. According to the Phnom Penh Post, the organisation is one of a handful of NGOs funded by the globalist billionaire that Ministry of Interior lawyers have accused of being complicit of the opposition’s alleged attempt to overthrow the Cambodian government, which is a close ally of China. In August, the government shuttered the Soros-backed National Democratic Institute (NDI) and gave staff members from abroad a week to leave the country, for failing to register with the Ministry of Foreign Affairs and tax department — a violation of NGO laws. The organisation’s neutrality was questioned after leaked documents from a training session with Cambodia’s opposition appeared to show the NDI providing them with a strategy to defeat the government in elections next year. 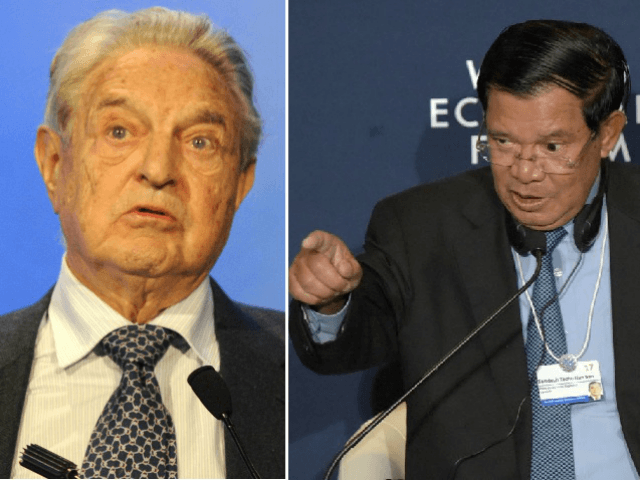 Soros’s Open Society Institute was named by a lawmaker from the ruling Cambodian People’s Party (CPP) in a presentation entitled “Colour Revolution and War Destruction” made to about 100 parliamentary staff members at the National Assembly, the Phnom Penh Post reported in May. Chheang Vun accused the Hungarian financier’s international grantmaking network, its grantee NDI and its “partner” Freedom House, along with the U.S. of using civil society actors to push regime change in countries that follow their own interests. Last week, Breitbart London reported on the U.S. State Department’s controversial announcement it will be splashing $700,000 on “democracy and human rights programming” in Hungary, where the conservative government has spoken out against Soros’s funding network. Hungarian Prime Minister Viktor Orbán last month denounced the mass migration agenda aggressively pushed by NGOs backed by Open Society Foundations as a means to eradicate Europe’s cultures and Christian identity. “The Soros network has an extensive sphere of influence within the European Parliament and other EU bodies,” Orbán said, stating that the network aims “to build a Europe of mixed population and to condemn the Hungarian government for opposing their view on migration”.